Hello Lisbon! EUSIPCO 2014, here I come! As hinted in a previous post, together with Menno Müller I had a paper submitted to EUSIPCO 2014, and yesterday we finally got the review results. It got accepted by all reviewers, and several of those six (SIX!?!!) really liked the paper, so naturally I'm pleased as punch about it. 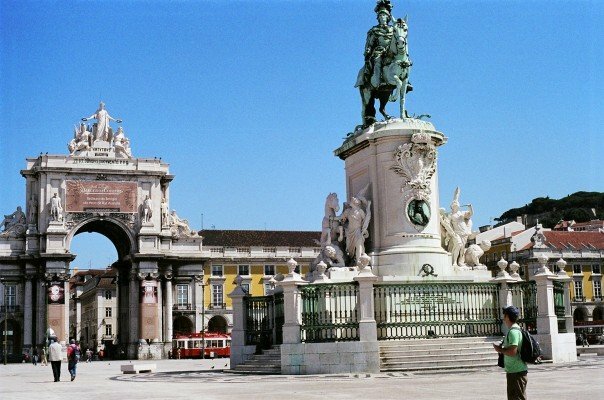 And of course I'm already looking into how to get to Lisbon and what else to go see when I'm there. So while I can't publish the paper on my own homepage until after the conference is over (and besides, the reviewers did ask for some minor corrections that I still have to put in), I can now refer to: J. Thiemann, M. Müller, and S. van de Par, "A Binaural Hearing Aid Speech Enhancement Method Maintaining Spatial Awareness for the User", to be presented at EUSIPCO 2014. I'm not that great at Python yet. But practice makes perfect, so just to see if I can do it, I wrote this Sudoku solver in Python (needs v3). The algorithm is my own though I don't think it is very (or at all) novel, just actually looking for other solvers would spoil the fun! The implementation is also probably overly byzantine, mostly due to the way the state is stored. This is done as follows: at the bottom is a list of states for each symbol in a given cell, the states are one of "this symbol is possible here", "this symbol is impossible here", "this symbol is here (set by specification)", and "this symbol is here (set by the solver)". The last two are really the same for the algorithm but eased my own understanding and debugging - but this adds lines to the code since both states need to be checked in some cases. The set of states for each cell are then bunched into a list for each row, and then all rows are bunched into a list. So, to find out if the "4" is possible in column 3, row 7, check if state is set to 0. After setting a cell to some symbol, mark the same symbol as being impossible in cells in the same groups (row, column box). For all cells, check if there is the case where a single symbol is not impossible. If so, set the cell to that symbol. For all groups, check where within a group a given symbol is possible in only one cell. If so, assign that symbol to the open cell. If in either of step 2 or 3 a cell was set to some symbol, restart from one. Repeat this until neither of the two last steps sets a new cell to a symbol, at which point the puzzle is solved, it's not completely specified, or there is an ambiguity that I don't handle in this code (I think it is possible for some sort of circular ambiguity to exist). coherence to the theoretical prediction. Here is my primary DAGA 2014 paper, where I examine some of the intermicrophone coherence of the DEMAND recordings. Also, I experiment a little with calibration, using multidimensional scaling. Not much one can squeeze into two pages. The presentation was a bit of a bust - they put me in a session more about policy and noise pollution etc. ("Psychoakustik - Lärmschutzpolitik"), so there was not much useful interaction. Oh well, it happens. The paper is here, and the presentation slides here. This might be quite useful if you're using DEMAND. The question if anyone is actually using DEMAND (other than me) is still open - I would love to hear from anyone who is. A bit more interesting is a paper written by a M.Sc. student in our lab, on the test results of a hearing aid algorithm we've been working on. 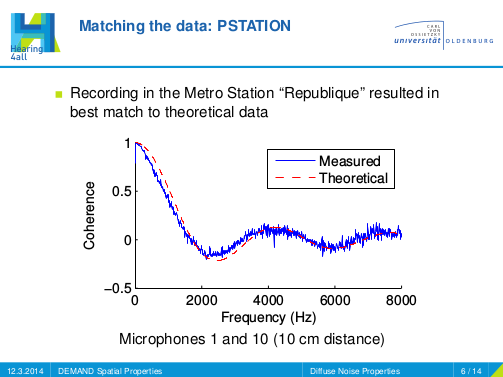 The paper is "Erhaltung der räumlichen Wahrnehmung bei Störgeräuschreduktion in Hörgeräten", by Menno Müller, Joachim Thiemann, Daniel Marquardt, Simon Doclo and Steven van de Par, and the method we use to do binaural noise reduction with preservation of spatial awareness is outlined. A more detailed paper has been submitted to EUSIPCO 2014, and in about 2 or 3 weeks I should find out if that has been accepted.